After having to reschedule several times, primarily due to winter weather, China Primary School was finally able to hold their gratitude assembly last month. 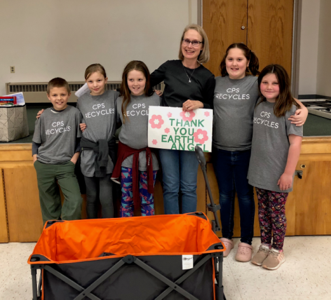 The assembly, which they had been planning since applying for the district’s Gratitude Grant last fall, had two purposes; the first was to show appreciation to the staff of the China Transfer Station for the service they provide our community and our planet. The students made thank you cards and had assembled a basket of goodies for the staff. The students and staff of CPS also wanted to use this time to recognize their own “Earth Angel”, Katy McCormac. McCormac and her small group of volunteers gather and sort the school’s recyclables each week and take them to the transfer station. CPS was pleased to present McCormac with a cart to make her very important labor of love a little easier. This assembly was a long-awaited opportunity to acknowledge all that these wonderful people do to help our community and teach our young people about the importance of conservation.